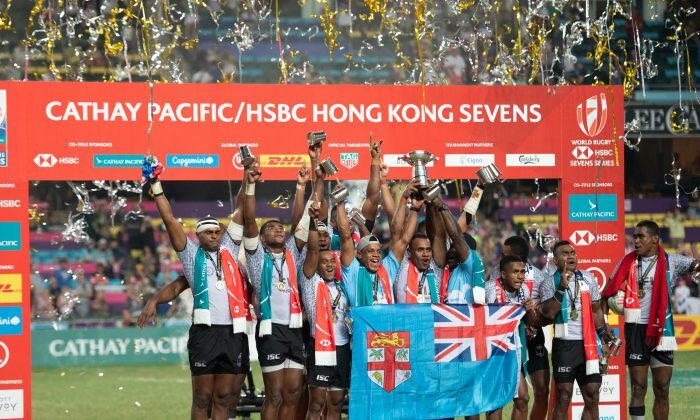 HONG KONG—Five-star Fiji created history by securing a fifth consecutive title in Hong Kong with a 21-7 victory over France in the Cup final. Over the course of three scintillating days of action, Gareth Baber’s side enthralled the crowd as they achieved something that no other side has ever been able to do. In the Cup final, Jerry Tuwai, 30, who is the only current player to have played in all four of the finals, pulled the strings majestically, while Aminiasi Tuimaba scored a brace and Vilimoni Botitu also crossed for a try. After their silver medal in Vancouver, France were playing in their second consecutive Cup final in a season, which is something that they hadn’t achieved before. The last time they appeared in a Cup final was back in 2012. They started at pace, however an early knock-on handed Fiji possession and Baber’s outfit didn’t need a second invitation to fly. The rest of the half belonged to them, as the HSBC Player of the Final Tuimaba, and Botitu, combined to cross twice with each setting the other up. After the break, Fiji’s 14-0 lead was tested when they went down to six players and France were awarded a penalty try for a high tackle. However, from 14-7, Fiji rallied and Tuimaba’s second ultimately ensured that history would be created in front of a sold-out crowd. With just three full rounds to go on the HSBC World Rugby Sevens Series 2019, this tournament victory means that Fiji jump ahead of New Zealand in the world series standings to sit in second. The USA remain top with 130 points, while South Africa are fourth on 99 points, nine ahead of their chasers England in fifth. At the end of all ten rounds of this year’s world series, the top four teams will confirm their places at the Tokyo 2020 Olympic Games. Japan are the only side currently qualified, due to automatic qualification as the host nation. The USA ensured a complete set of medals on the world series this year with a 22-10 victory over Samoa in the Bronze Final. After four silvers and a gold, this third-place finish secured Mike Friday’s side another 17 world series points and puts them in a position to potentially secure qualification for Tokyo 2020 this weekend in Singapore. In the Bronze Final, the two sides matched each other physically in the first half, but it was the Eagles’ two tries that trumped Samoa’s one. Their second saw Carlin Isles notch up his ninth of the weekend, a number that no other player has reached in a single tournament at the Cathay Pacific/HSBC Hong Kong Sevens. After the interval, the match opened up and John Vaili’s deliberate knock-down earned him a yellow card. With the extra player, the USA struck again as Joe Schroeder made his presence felt off the bench. They turned on the charm as the second half continued, with a further try from Marcus Tupuola, before Melani Matavao completed Samoa’s tournament on a try-scoring note. In an absorbing fifth place final, Santiago Gómez Cora’s Argentina overturned a series of three successive losses to New Zealand in order to take the spoils by 21-14. The two sides were locked at 14 points apiece with less than a minute to play. After the referee penalised the Kiwi’s, Kurt Baker was sent to the sin-bin for throwing the ball away and Argentina pressed with the extra man. They retained possession as the hooter sounded and a penalty handed them the opportunity for a scrum. The All Blacks weathered that set-piece well before Matias Osadczuk’s determination proved to be the difference. Osadczuk shrugged out of the clutches of two big defenders and raced home to dot the ball down for the ecstatic Pumas. Earlier in the day, Argentina had toppled the back-to-back world series champions South Africa 19-17 in the fifth-place semi-final, with Osadczuk again proving to be instrumental. In the other semi-final, New Zealand got the better of England 17-10 and, at the end of the day, the UL Mark of Excellence was handed to the All Blacks co-captain Scott Curry. The award marked the solidarity shown to the side from a number of teams over the three days in response to the recent events that have affected the country. Scotland beat Japan for a second time in the tournament in order to clinch the Challenge Trophy by 26-24. The two sides first met in Pool A when co-captain Jamie Farndale scored a hat-trick as his side prevailed by 33-19. The two teams’ second encounter was a classic game of two halves and showed the tenacity that John Dalziel’s men have, as they finished the stronger of the two. Scotland found themselves 24-7 down midway through the second half before three tries in less than three minutes turned the clash on its head. The potent period levelled up the encounter and Gavin Lowe then stepped up. His final conversion made the goal-posts illuminate green and ultimately sealed their victory. The side’s route to the final saw them beat Spain 33-14 and Australia 19-17 in the semi-final. The manner of the Challenge Trophy final loss will have been tough for Japan to take, however their run to that point does have a positive outcome for them. The side’s ability to reach that stage means that they move above Wales into 14th place in the world series standings. In three rounds’ time, at the end of the world series, the side that finish in 15th will be relegated, with their place being taken by newly-promoted Ireland.